Birthday Gift to Milan, Italy for my fav girl, my Kaiya Milan! In October 2016, my daughter and I will travel to Milan, Italy to visit fashion houses, museums, parks and to shop, shop, shop! This trip is of utmost importance to her because she was “made in Italy” as her middle name infers! We could have named her Florence, Rome or Venice…All cities visited during her “making”. We opted for the name Milan. It’s no wonder it’s her choice of Italian cities to visit! So, as I always do, I research the most outstanding things to do in every European city I visit so thought you would enjoy my findings! Remember– I do the research so you do not have to! Milan is one of the largest cities in Italy and one of the most highly developed areas of all of Europe. It makes for a great combination of a city vacation amidst cultural and historic relevance. Not only is this where you will find Da Vinci’s famous painting “The Last Supper” but this city is also one of the best shopping centers of the world. YIPPEE!! Many fashion designers have their houses here and you will find opportunity for a lot of window shopping or real shopping while in Milan for your Italy vacation. We will be there for fashion week, which at first, I thought was a big mistake due to the crowds- but why would I not be there for this amazing event. To share with my daughter makes it a bigger deal! During fashion week, the city becomes one of the greatest spectacles in the world. Even if you can’t see a show, the city comes alive with fashionistas, designers and the like strutting around to see and be seen. So we have our cameras (iphones!) and some really cool garb to waltz amongst the models, celebrities, designers, and various hangers-on from around the world as they (WE) all vie for a bit of the spotlight!! The energy is amazing and it’s one of the more fun free things to do in Milan each fall (and each spring). 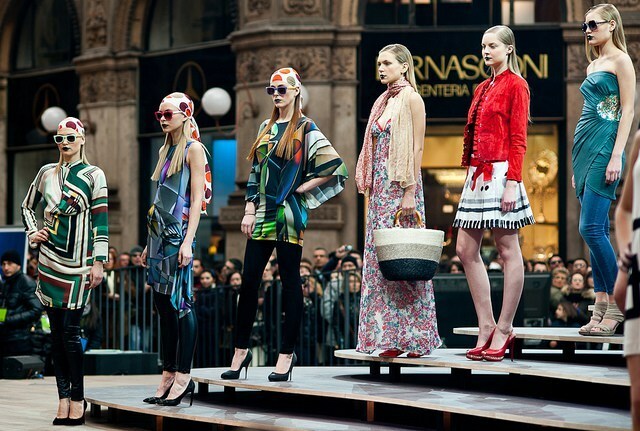 Milan is known as Italy’s top fashion city and it’s a good place to shop for designer clothes, shoes, and accessories. Good shopping streets include Via Dante between the Duomo and Castle, Corso Vittorio Emanuele II near Piazza della Scala, and via Monte Napoleone near the Duomo. For exclusive fashions, head to the area around via della Spiga called the Quadrilatero d’Oro or Golden Quadrangle that also includes Via Montenapoleone, Via Andrea, Via Gesù, Via Borgospesso, and Corso Venezia. Pack your plastic and put it in the bag! Aramni, Cavalli, Valentinio and Versace!!! Oh My! Corso Buenos Aires has less expensive shops and chain stores, many of them even open on Sundays. Also, don’t miss out on some of the smaller, less-crowded boutiques on nearby Via Solferino, or in the southern quarter of Porta Ticinese. If you like malls, milan has that too! The Galleria Vittorio Emanuel II is said to be the oldest shopping mall in the world. It was designed and built in the 1800s and features a huge glass and steel arch covering a long street. At its center is a large glass dome and to this day the oldest shopping mall in the world continues to be a bustling retail center with shops selling everything from books to haute couture and numerous restaurants serving tourists and residents of Milan. The Galleria Vittorio Emanuel II connects 2 of Milan’s most popular attractions. These are the Duomo and the Teatro Ala Scalla. The Duomo is the cathedral of Milan that we will definitely visit while on vacation in Italy. This is where the Archbishop of Milan resides. With its amazing gothic architecture this cathedral played an important role in establishing Catholic traditions and spreading the Catholic faith. In Italy, the only church that is larger than the Duomo is St. Peter’s Basilica in the Vatican City in Rome. Not sure, she will enjoy this but if I can get cheap tickets, I will see if she is interested, if only for one half hour!- Just to have the experience of being in one of the most famous opera houses! The Teatro Alla Scala is a world famous opera house in Milan. It was built in the late 1700s after a carnival fire destroyed the previous opera house. It was known to be the gathering place of the rich in Milan and had a gallery area above the boxes where the less wealthy were allowed to come to also enjoy the opera performances. When in Milan on your Italy vacation, you must also visit the Sforza Castle. It took 10 years to build this in the 1300s. It was built to be a defensive fortress and has undergone several reconstructions, additions and transformations over the centuries. There are several museums here that we will visit during our stay! This castle also holds Michelangelo’s final work of art, a marble sculpture known as the Rondanini Pieta. Climbing to the roof of the Duomo: The roof of the city’s principal landmark gives you an eagle-eye view over the busy streets and alleys downtown. More importantly, this is where you can get up close and personal with the sculptures of saints and spookily realistic gargoyles, who are also keeping tabs on deeds good and bad of the inhabitants below. A Must do! Window shopping for a sleek home: Now this is a must fo r as a designer , I live for this!! So excited! Milan is the modern furniture capital of the world, a superlative that is a lot more fabulous than it sounds once you see the latest designs. There’s no better way to immerse yourself in the height of hipness than peering through the store windows along Via Durini. I wonder how much to ship to the USA?? Finding textiles that I just love is a must in Milan! The aperitivo hour: Well alright now!! They don’t call it Milano da bere (“Milan in a glass”) for nothing. This city celebrates the art of the cocktail with free finger food and pasta starting around 5pm until people get hungry for a real dinner at about 7pm. A few of the more hopping venues are Le Biciclette (via Conca del Naviglio 10), Victoria Cafe (Via Clerici 1) and really anywhere in the Brera district. The free food is not as remarkable as the people-watching and the Campari-based cocktails. I’ll just say, this will be our daily jaunt each evening! If you have an extra day in Lombardy, a day trip to Lake Como is nearly obligatory. The heart-stopping scene of Alpine slopes crashing into the cobalt water, whose coastline is studded with medieval burghs such as Bellagio and ringed by palm trees and bougainvillea, is unique in the world. Small wonder that superstars from Versace to Clooney have chosen this backdrop for their second (or third) homes. Check out my best seller, How to Enrich your Life through Travel. You will be inspired! Juicing- is the Hype Real?